How Do You Write A Sales Page? It’s the question that has been asked over and over again, yet nobody seems to have a definitive answer. I’ve been creating websites and sales pages (or sales copy) for the past few years, but when it comes to writing those pages, I tend to stumble along hopelessly and pray that something good comes out the other end! It would be easy to pay someone a small fortune to write a sales page for you, but that person wouldn’t know your product like you do, and I think that would come across in the sales copy. It’s always better to write your own, but if you write your own, will you be able to make the page convert as well as the pro’s? Or do you go with a professional copywriter that could claim to bring in higher conversions, but they may not get all of the points across on the sales page, which could in turn lead to a lot of support requests and refunds after purchase. Well, I had this dilemma a few months ago when I was creating the copy for my Boomerang List Builder product. I had created a basic sales page that included the main features and selling points of the software, and then I did something that I don’t normally do…..I asked for advice! I sent an email to a fellow Yorkshireman, Randy Smith. I’ve known Randy for a couple of years and he works as a copywriter and an Internet Marketer. I sent my basic sales page over to Randy, he then replied and showed me ways to improve the conversions without getting rid of my selling points and features. The Boomerang List Builder sales page now converts at around 5% which is very good for that sort of product! But How Can This Help You…. In the eBook he shows you exactly how to create the perfect sales page, I won’t go into a lot of detail because Randy wouldn’t appreciate me disclosing the tips available in his book, so I’ll list the contents for you! 1. 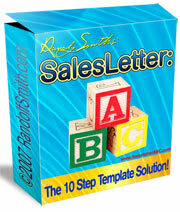 What is a sales letter? The book is split into two parts, I’ve just shown you the first part by posting the contents, but for me, the second part is as good, if not better. 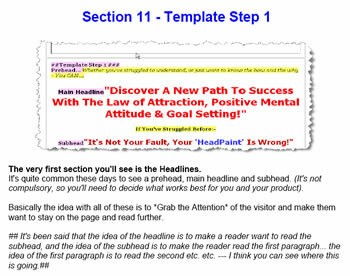 In part 2, Randy gives you a template that you can use on ANY sales page. He breaks down every part of the page, and shows you what goes where, and why! In total there are ten templates included in the eBook, these show you exactly how your page should be structured, worded, and formatted. Head on over to Randy’s site for a closer look, at the time of writing the price is a very low $27 so get in there quick! P.S. When you read Randy’s book, try some of his methods out on your own copy and let me know how you get on. I’d like to bet that your conversion rates improve! Well, we are now almost into February and 1/12th of the year is already gone..so why exactly am I doing my plan for 2008 now? This is something I have been planning to do for the past 3 months, but as with a lot of things recently time is a massive problem. 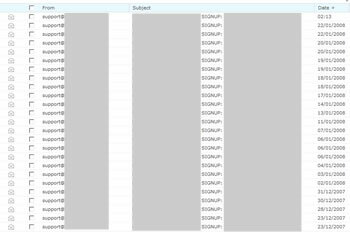 I currently have one “x” site that makes me around $1,000 each month. This site isn’t anything to do with Internet Marketing, and it doesn’t involve me selling anything, it also doesn’t involve a mailing list. This “x” site is totally separate from my other online ventures. So if I were to make ten “x” websites, then I would be able to follow the steps I have taken with the first “x” site, and make a good amount each month, from each site….More on this later. Again, this is something I have been looking into for some time, but 2008 will (fingers crossed!) see a “Pro” version of the software released. I’ve had a lot of feature request from existing customers, a lot would fit easily into the existing software, but the other, more complex suggestions would need a lot of extra work…but they would be REALLY cool features! So keep your eyes open for a “Pro” version sometime in 2008. D9 Hosting was one of my (and Paula my business partner) biggest successes of 2007. We initially started off very small scale, only expecting a small trickle of customers. The uptake of accounts from you guys has been amazing and has surpassed our wildest expectations, so it is our goal to continue to improve our service to you. We have some plans for 2008 and they will be revealed to D9 customers in due course! 4. Continue To Write Blog Posts/Newsletters! This blog is coming up to it’s 2nd birthday, despite time being very hard to come by these days I always try and put aside at least an hour a week to write helpful posts, and reply to your comments and questions. I am now putting it in writing..so you can slate me if I don’t deliver, but I will strive to make at least one post on this blog at least every two weeks! This is continuing on from point one. Take a look at these screen shots below, these show my earnings from ONE “website x” (this is the project codename!) website that I currently run. I’m not showing you these to show off or for a big pat on the back, I’m showing you what you can achieve from one website, that generates less than 30 hits each day! Now my first aim, and it’s for purely selfish reasons, is to create more of these “website x” sites, so that I can make more money, and generate more screen shots for my product that will be coming sometime in 2008. I’ve decided to create a brand new, video course, showing you exactly how I create these “website x” sites, and I’ll show you, step-by-step what you need to do to get them online and how to generate traffic too them. I am also planning to record myself making one of these sites from scratch and including that in the package. So there we have it, my plans for 2008. Apologies if it sounded it a bit rushed, that’s because….well, it was! But I’ve finished by 11.30am so now I can get ready and go out for lunch. Do let me know any comments or questions, I’ll be checking them out when I get back, and why not let us in on your plans for 2008, what are you going to be doing? Is This The Death Of Pop-Ups? Today I decided to add a new category to my blog, it’s called “My Offers” and I will be posting all of my “cool products” in here from now on. As well as the new category I also added something else to my blog today, more of a test than anything else. Take a look in the top right hand corner, now tell me that doesn’t grab your attention more than a standard pop-up! I don’t know about you but every time I see a “Peel” on a website, I ALWAYS feel that I have to hover my mouse over the ad just to see what is hiding behind the peel! I honestly believe that these Peelaway ad’s can be a lot more effective than the old fashioned pop-up’s. The peel on this blog is just an example to show you, but you can fully customize the peels with your own custom graphics so you can use them to promote any of your own products, or products as an affiliate. What’s more there is no “per-site” license so you can add the peelaway ad’s to as many of your sites as you wish, plus if you get in quick the price is only $37 (correct at the time of writing). And I’m probably not supposed to say this, but after you buy you will be presented with a one time offer, this will give you the chance to purchase resale rights to the script. So instead of promoting the script as an affiliate, you can sell the script yourself and keep all of the profits! So…it’s 2008, it’s scary to think this blog has been on the go for almost 2 years, doesn’t time fly?! “It’s January 1st, you are feeling terribly hung over from the night before, your head is pounding and all you want to do is go back to sleep. But you can’t, why? OK, so maybe you don’t get THAT worked up about changing your copyright notices, but it is still a job that needs doing, and if you have a lot of websites it could take you a full day to change everything to the new date. You could always leave them with the old year on but that does look a bit unprofessional and lazy. Luckily there is a quick way to change your copyright notices to the correct year, on auto-pilot. As soon as the clock hits 12.01 on January 1st, your copyright notices will update. Yes, adding a simple snippet of PHP code to your page will automatically show the correct year to your website visitors. I have already implemented it into this blog, scroll right to the bottom and look at my copyright notice, the notice will always show the correct date, you will need to wait until this time next year to test it out but you can take my word for it! Now let me show you how to do this. That will automatically display the current year on your page, that’s it, dead simple! Just a quick side note, don’t copy/paste the code direct from this page, WordPress tends to mess up the little quotation marks when you copy/paste! As the code is PHP then you need to make sure that your page is saved with a .php extension, and that your web server is capable of running PHP pages. – If it isn’t, why not check out D9 Hosting? You should now be ready to add auto-updating copyright notices to your websites. If you haven’t yet updated your 2007 notices why not give it a try? As always let me know if you have any questions and feel free to leave any comments. Here’s too a prosperous 2008!